MOSCOW (Reuters) - U.S. sanctions targeting Russia's nascent high tech industry have caused a Russian microchip company significant financial woes and delayed the launch of an initiative meant to produce substitutes for Western products, the firm's owner said. President Vladimir Putin has stressed the need to develop Russia's domestic tech industry to make it less dependent on Western equipment. 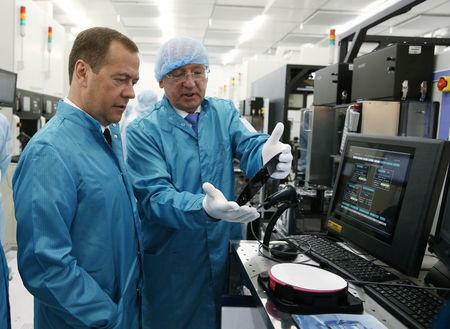 But Moscow's efforts to manufacture Russian microchips and other high tech products have been thwarted by U.S. sanctions against a string of Russian tech companies. Angstrem-T, which makes semi-conductors, has accumulated significant debts and is set to be taken over by state development bank VEB after failing to reimburse an 815-million-euro ($944.75 million) loan dating back to 2008, said Leonid Reiman, chairman of the company's board of directors. Reiman, Russia's former minister of communications and information technologies, said the company's inability to reimburse its debt was in part tied to U.S. restrictions on the import of dual-use technologies and its addition to U.S. Treasury sanctions in 2016. The U.S. moves were prompted by Russia's annexation of Ukraine's Crimean peninsula in 2014 and its support for separatist rebels in eastern Ukraine. It has imposed further sanctions against Russia since 2016 over other issues. "Although we initially received the (U.S.) State Department's consent for this project and the delivery of the technology here, the sanctions caused the deadlines for its completion to be drawn out," Reiman told Reuters. "The factory is working, the products are being produced, but the question of procurement remains." "It's good that we are starting to produce these ourselves," Medvedev said at the factory's opening, a month before Angstrem-T itself was targeted by the U.S. sanctions. "It's a question of import substitution." Reiman would not disclose the magnitude of Angstrem-T's debt. According to a Russian database that aggregates company data, the firm had 87.4 billion roubles ($1.34 billion) in debt last year. During the same period it recorded revenues of 101 million roubles. A source in the field of microelectronics in Russia said the sanctions and repeated delays in the project had caused Angstrem-T's products to become outdated. A draft Russian government roadmap for the development of the microchip industry seen by Reuters says that once VEB's takeover is complete, Angstrem-T should shift its production to the more modern 28-nanometre chips.